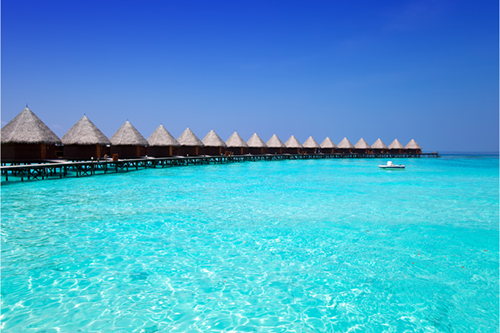 Located in the heart of the Indian Ocean, the Maldives are made up of about 1,200 incredible islands. About 80 of these islands are home to hotels and resorts where you can base yourself during your time in this beautiful country. The islands of the Maldives are just the way you would picture paradise to be. You’ll experience white sand beaches, bright turquoise water, tropical trees and plants, and villas over the ocean. As well as being a scenic place to have a relaxing holiday, the Maldives are a great place for some island adventures. The islands have beautiful coral reefs that you can view up close by snorkelling or diving. Other popular sports in the Maldives include surfing, paddle boarding, canoeing, and jet-skiing. While visiting the Maldives, you’ll get to see some incredible wildlife, bright coloured sunsets, and an exciting local culture. Maldives holidays can quickly add up once you have factored in hotel and flight costs. In order to save some money on your island holiday, plan your trip with one of Webjet’s Maldives holiday packages. The Maldives packages bundle together flight and hotel costs, which can shave up to several hundred dollars off your travel expenses. Webjet’s Maldives accommodation and flight packages will also save you time. Rather than you trawling the internet for the best deals, Webjet will compile a list of options for you, making it easy to plan your Maldives trip. Use the time and money you’ll save to plan all of the exciting activities you want to try during your time in the Maldives. Maldives holiday packages are great options for everyone, but are especially perfect for couples who are looking for a romantic holiday on a budget. Throughout the Maldives, you’ll find a number of international and domestic airports, making it easy to explore every corner of the country. There are four international airports. The largest and main airport in the Maldives is Malé International Airport (MLE), which is located next to the country’s capital city of Malé. The other international airports to receive flights into the Maldives are Gan International Airport (GAN), Hanimaadhoo International Airport (HAQ), and Villa International Airport (VAM). The country also has eight domestic airports which receive flights from within the Maldives. Travelling from Australia, several airlines offer flights to the Maldives. These airlines include Qantas, AirAsia, SriLankan Airlines, Cathay Pacific, Singapore Airlines, and Emirates. There are no direct flights available between Australia and the Maldives, but you can schedule a flight with one stopover from any of the major Australian airports. Common stopover cities for flights from Australia to the Maldives include Singapore, Hong Kong, and Kuala Lumpur. If you’ll be travelling to an airport in the Maldives apart from Malé, your journey will most likely also include a stopover in Malé or in Colombo, Sri Lanka. The Maldives offer a variety of accommodation options, but the most common are overwater bungalows. These are the typical choice for visitors to the Maldives as they offer a one-of-a-kind experience with unparalleled views. Overwater bungalows can get pricey, so if you are on a budget, you will also find several affordable hotels that still have access to the beach. If you are looking for an overwater bungalow experience for your time in the Maldives, this hotel is a great option. It is located in the southern waters of the Baa Atoll and can be reached by seaplane from Malé in 30 minutes. The villas are designed in a comfortable and luxurious style that is traditional to the Maldives. The overwater villas include private decks and fresh water pools. If you would prefer to stay on land, the hotel also offers beachside villas, which have private terraces and are a quick walk to the water. All hotel guests have access to some spectacular amenities, including two restaurants, two beachside bars, a luxurious spa, and personalised tours of the nearby coral reefs. The Kandima is another take on overwater bungalows. Their Aqua Villas have a sleek and trendy design with pops of colour. The villas offer stunning views and can be booked with a jacuzzi or private pool. Back on the beach, there are oceanside villas and studio rooms available as well. They have beautiful views of the ocean and have a similar interior design to the Aqua Villas. Within the resort, you’ll be spoilt for choice on where to eat and drink. There are four sit-down restaurants, a deli, a cafe, a beach club, and a pool bar. Other resort amenities include access to snorkelling equipment and paddle boards, a fitness centre, a large swimming pool, a tennis court, and live music twice a week. The Arena Beach Hotel is located on the South Malé Atoll and is an affordable option for travellers to the Maldives. The hotel is made up of 50 rooms spread across three storeys. Rooms are designed in a contemporary and stylish manner. Many of the rooms also include a balcony looking out over the Indian Ocean. All throughout the hotel, there are stunning views of the beach and ocean. The hotel has its own private beach where you can enjoy activities such as snorkelling and diving. Other amenities include a restaurant, romantic dinners on the beach, and a variety of tours and excursions around the Maldives. The Maldives are a series of about 1,200 islands that are absolutely gorgeous. The Maldives are perfect for people who love to relax as well as people who like to stay active on holiday. There are incredible beaches, luxurious resorts and hotels, snorkelling and diving, and plenty of water activities to keep you entertained during your time in the Maldives. The Maldives are home to some incredible coral reefs. The best way to experience them is to get in the water and see them up close. A variety of snorkelling and diving excursions are available throughout the Maldives. Many hotels even have snorkelling gear you could use at the beach by your hotel. There is incredible snorkelling and diving all over the Maldives, but some of the best places to check out include the South Malé Atoll, Fihalhohi Island, and Mirihi Island. While these are some popular options, you’ll find great snorkelling and diving all over the Maldives. You’ll see coral, tropical fish, sea turtles, and possible even a reef shark. The Maldives are home to a type of dolphin called the spinner dolphin. Each afternoon, they make their way out into the lagoons around the country to search for food. When they jump out of the water, they spin in circles. The dolphins are sociable and happy animals and love to be around people. You may see them from a boat or while paddle boarding or canoeing in the lagoons. If you stay in an overwater bungalow, you may even spot some from your deck. Many hotels offer dolphin cruises, giving you the opportunity to watch these animals from up close. Many hotels and resorts in the Maldives are located on their own private island. In order to experience the true culture of the Maldives and meet some locals, head to one of the islands inhabited by locals. There are about 200 local islands dotted around the Maldives where you can walk through the villages, taste some local food, and learn more about everyday life in the Maldives. The capital of Malé is a great local spot to experience since you will likely fly in and out of its airport. From your hotel, you can likely catch a ferry from your island to one of the nearby local islands for a day.